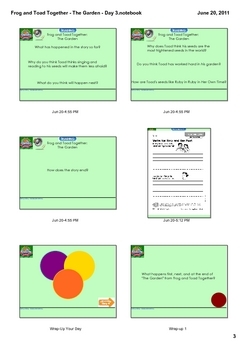 Have you been searching the internet for Reading Street resources for the SMARTBoard only to find lessons that relate to only part of the instructional day? Are you tired of fumbling around with the TE and CDs? Are you looking for something even a substitute could easily use? 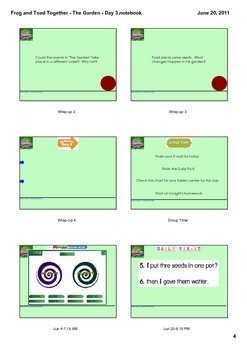 Do want a SMARTBoard lesson for Reading Street that covers all the instructional material and includes all the songs and audio text needed for the lesson? If you answered yes to any of these questions, then your search is over. 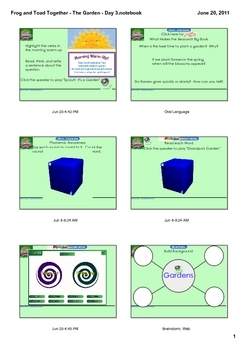 This lesson covers all the instructional content for the story and day named in the title. It also includes all the Sing With Me, Build Background, Audio Text, Read Aloud Anthology, and even the Spelling Test sounds in the pages. Day 5 files also include the selection test as a SMART Response test. Clear instructions are included on each page so even teachers and substitutes unfamiliar with Reading Street can teach the lesson. We have used your Smart Board entries for Reading Street since we got Smart Boards in each classroom last fall. We Grade 2 teachers at Pine Street Elementary in Presque Isle, Maine want to thank you VERY MUCH for all the work you put into loading lessons for each story. We and our students have benefitted from your work. THANK YOU!!!! I recently was lucky enough to get an Interactive Whiteboard in my classroom, along with the rest of the K-3 classrooms in our building. We've been discovering more and more that we can do using the boards every day. We searched for Helen Keller material and your Reading Street lessons came up. We were thrilled when we discovered there were lessons for all of the stories in the Scott Foresman series. They are wonderful!!!! The kids love these lessons, and having the audio built right into each page means that I don't have to go searching for the correct number CD and the booklet that tells me what number the selection is on. My second grade team and I would like to thank you for sharing your lessons. The students and I are truly enjoying them! I really can't thank you enough! I am a second grade teacher in Citronelle, Alabama. I have been using the SMART Board pages you created to go with our SF Reading series and love them. Actually all 9 second grade teachers here use them and would like to say THANK YOU. We are fairly new to using and creating for the SMART Board and are greatly impressed with your work.